Today’s the day! (Cue orchestra…) I’m so excited! This is my very first crochet along and I’m so excited you are going to be making this along with me! 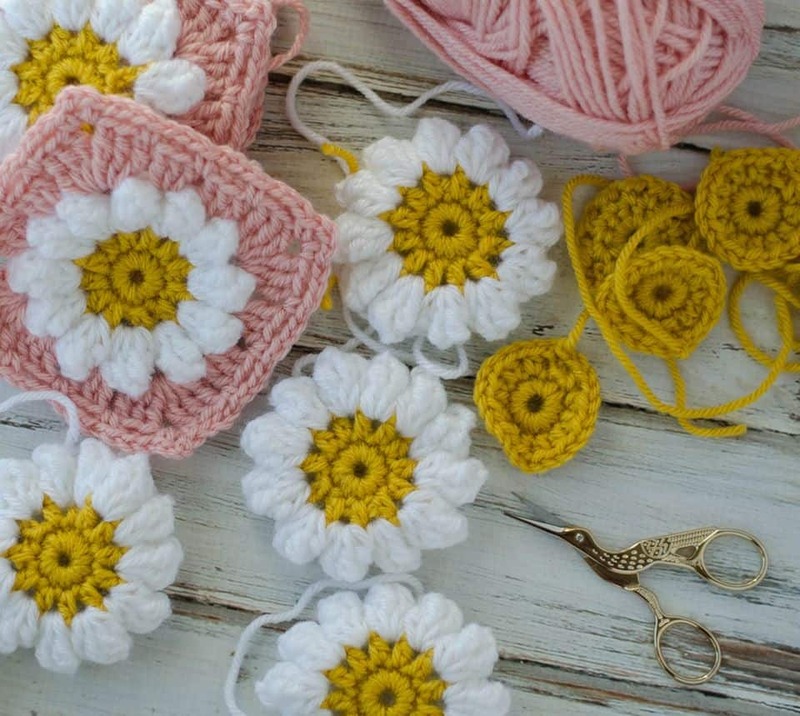 Today we are kicking off the Daisy Mae Bag by making the Crochet Puff Daisy Square! Isn’t she a beauty? I just love this light pink/white/yellow combo. I’m enjoying seeing the color combinations you’re coming up with in our special Facebook group. 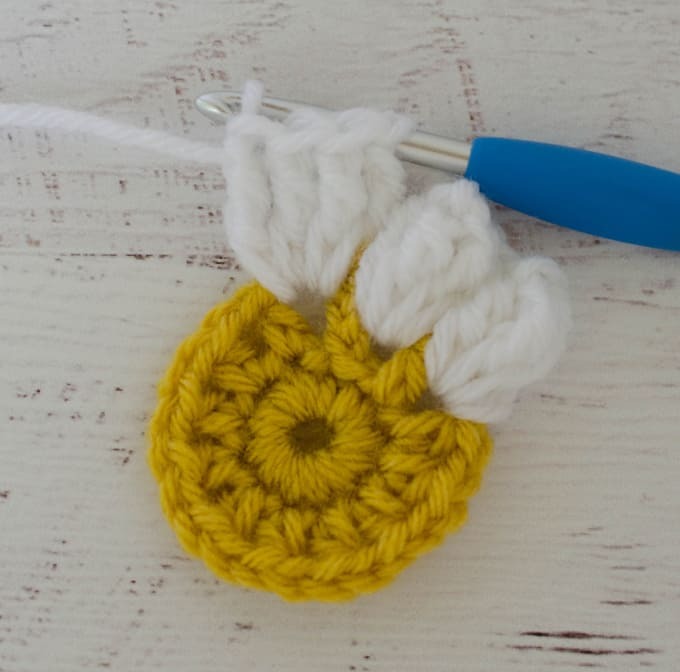 Click here to go over to Crochet 365 Knit Too Club on Facebook where we’re sharing crochet goodness and working through this fun crochet along together! If you don’t use Facebook, don’t worry. You can still take part in the crochet along by following along on the blog. If you missed the introduction and the supply list, head over here to get all the details! Each square is approximately 4.5” x 4.5” before joining. 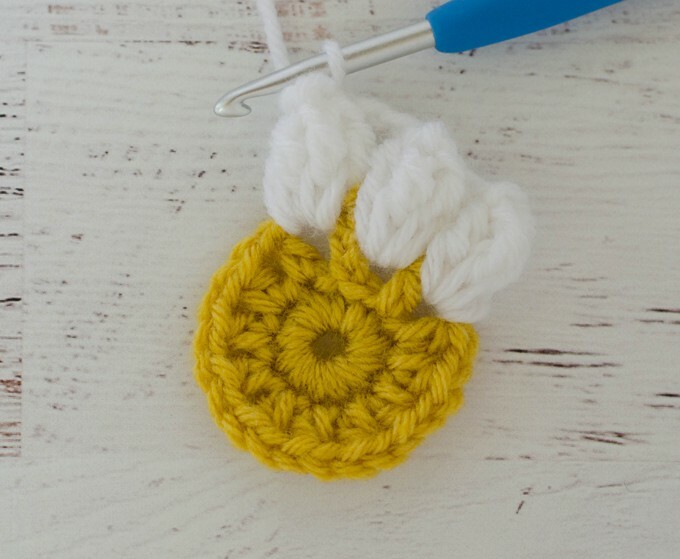 With yellow yarn, chain 4, join with sl st to make a ring. R1: Ch 1, 12 sc into ring, join with sl st to first st. (12 sts). R2: Ch 3 (counts as 1sthdc and 1stch), *hdc in next st, ch 1. Repeat from * around (12 hdc and 12 ch-1 sp). Join with sl st in top of first st. Fasten off yellow. Remove hook from loop and insert it into the top of the first stitch in the petal. Grab the loop while it is in this new position. Then pull the loop through the stitch on the hook. Petal made. Continue to make the rest of the petals as follows (noting the chain 2 in between each petal): *ch 2, 4 tr in next ch-1 space, remove hook from loop, insert into the top of the 1st tr of the petal and pull the last loop through. Petal made. * Repeat * to * 10 more times. Join with a slip stitch to the top of the first petal. (12 petals total). Fasten off White. Ok. That was the hardest part of this square. Now the center is complete and it’s time to turn this round daisy into a square! R4: Join pink in any space between petals with a sl st. Chain 4 (counts as 1sttr), 2 tr, ch 2, 3 tr (1stcorner made), *skip to next space, work 3 dc, skip to next sp, work 3 dc, in next space work 3tr, ch 2, 3 tr (2ndcorner made). Repeat from * around. Join with sl st to start of round. 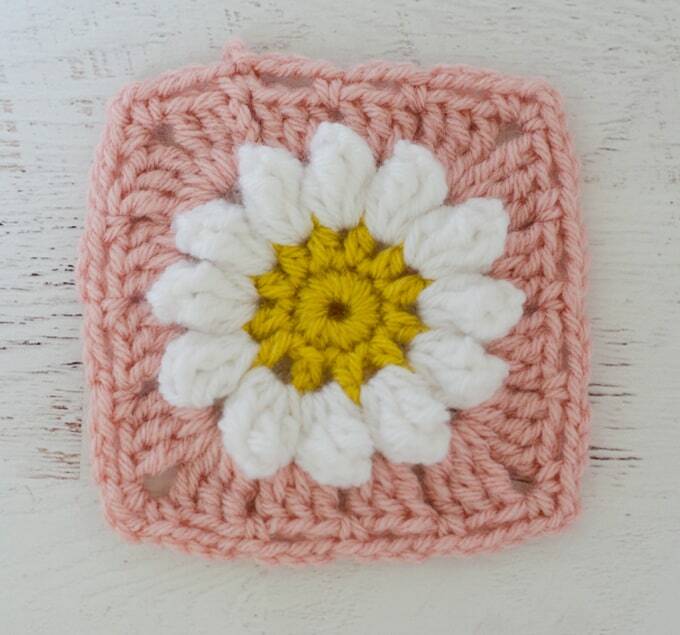 Note that the treble crochets in the corners help square off this cute Crochet Puff Daisy Square! Now it’s time to do one more round to prep for joining the squares. Continuing on with pink..
R5: ch 1 and sc in same space as joining. *Ch 3, [sc, ch 2, sc] (1stcorner made), [ch 3, sc in next space] 3 times. Repeat from * around, working a sc and chain 3 in each space (formed between the 3 stitch clusters from the previous round) along the sides, as well as the following sequence in each corner: [sc, ch 2, sc]. Join with sl st to start of round. Fasten off. 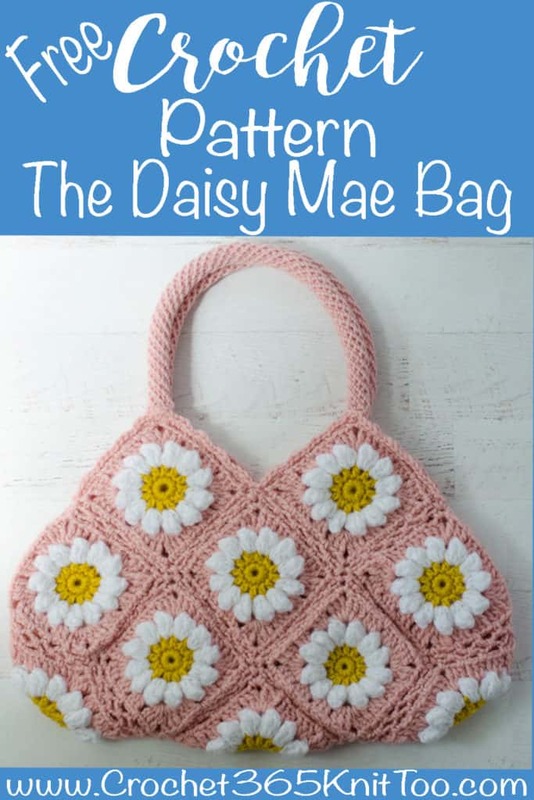 To continue with the Daisy Mae Bag Crochet along, please make 17 squares. Your squares should measure about 4.5 inches by 4.5 inches. It is ok if they are slightly smaller or larger. The pattern will still work; your bag just might end up a little bigger or smaller if the squares are slightly different in size! Don’t want to make a bag? Make several of these squares and use the joining technique for the upcoming part 2 of the CAL to make a cute afghan! I have a similar (but slightly different) afghan over on Etsy if you’d like to check that out here. Not a fan of the daisy but you’d still like to make a bag with us? No problem. Just find a similarly sized crochet square pattern and follow the instructions for row 5 when you are done. Row 5 preps the square for the super easy joining method we are going to learn in part 2. Remember the last row takes up about a half an inch. So you will want to look for a square that is roughly 4 inches across. 17 Squares? Are you KIDDING me? Does 17 seem like a lot? They go fast! You can either make one complete square at a time or do like I did and do 17 yellow centers. Then do ALL the petals. And then crochet the last 2 rounds! The yellow centers and white petals go really fast. And when you are done with those you feel really accomplished and ready to crochet the last couple of rounds. I actually worked on these while we were traveling by car on vacation. I kept dropping them off my lap and onto the car floor until I came up with the brilliant idea of taking a spare piece of yarn and threading it through each center (like threading beads) and loosely tied them together in a bow. When I wanted to work on one square, I would untie the bow, take out the next square and tie the rest back up. There you go. 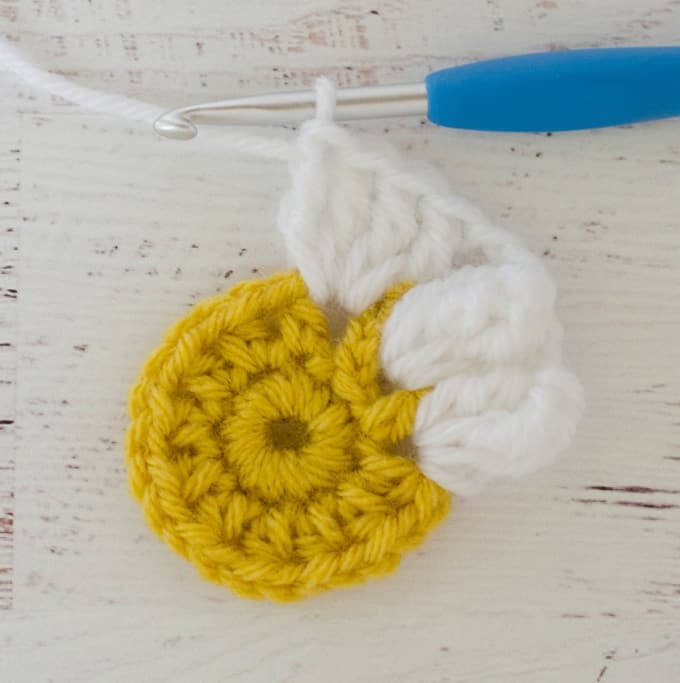 A crochet life hack you never even knew you needed! Remember to pop over to our Crochet 365 Knit Too Club on Facebook and show me your progress. And let me know.. are you doing each square one at a time? Or are you doing them in sections? I love seeing your finished projects! 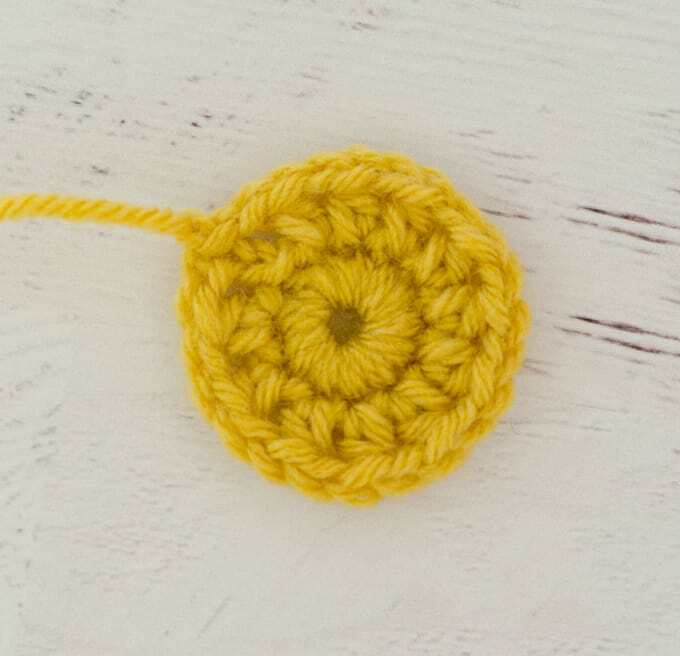 If you enjoyed making the Crochet Puff Daisy Square, I’d love to see yours on Instagram, be sure to tag me @crochet365knittoo. If you are on Facebook, stop over to the Crochet 365 Knit Too Facebook page and share a photo! I’d love to see your work! Written pattern copyright Cheryl Bennett 2018, all rights reserved. Please do not reprint or repost this pattern. 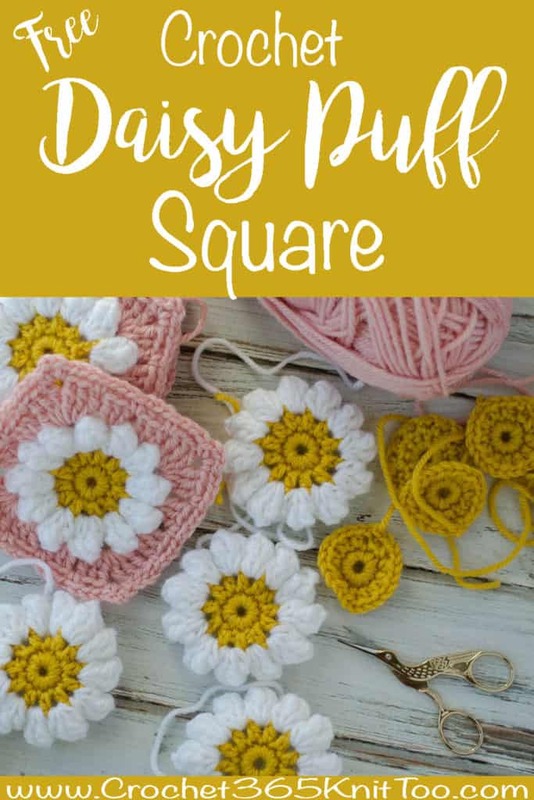 If you would like to share this Crochet Puff Daisy Square pattern with others, just link to this page. If you’d like to make items for sale from this pattern, please visit my About page for more information.